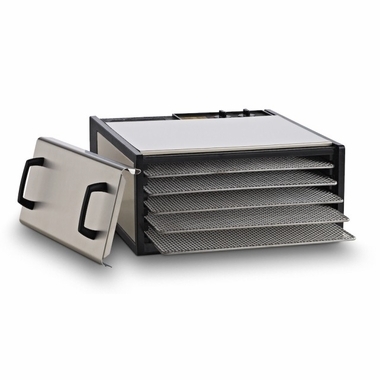 We are pleased to introduce the versatile Excalibur D500SHD 5 tray stainless-steel dehydrator. This home dehydrator machine helps every cooking and food lover preserve their food in a very healthy manner. The tray not only removes the moisture from the food, but also improves the flavor and nutritional value in many ways. Case exterior is made of Stainless Steel inserts. Case interior is polycarbonate, the same material as the black and white units. 26 Hour of uninterrupted operation lets you set it and forget it. Unit automatically turns off when the set time is complete. Adjustable Thermostat. Temperature range is low enough to preserve active enzymes in fruits and vegetables. Temperature range is also high enough to meet safety standards for dehydrating meat for jerky. Unit turns on automatically when thermostat is in use. The Excalibur D500SHD 5 tray food dehydrator features a very modern design which makes food preparation and preservation simple for you. Featuring stainless-steel exterior and polycarbonate interior, the tray is developed with air-flow mechanism and components which makes it an ideal home dehydrator for families, hunters, crafts people, volume pet treats, in-home dehydrating businesses. The Excalibur D5S00SHD home dehydrator also includes a recipe book which has certain tricks and tips provided for raw diet lovers and hunters to guide them regarding the benefits and perfect way of preserving food items etc. Built to last, the tray is developed with a patented Parallex� Horizontal Air Flow and Hyperwave� Fluctuation Technology, one of the most reliable heat/dry combination in the market. It offers uninterrupted 26 hours operation and turns off automatically after the completion of time. Adjustable thermostat helps you to make excellent jerky and produce low energy to maintain adequate level of enzymes and nutrients in the food. The unit turns on automatically when in use. These trays are available in polycarbonate plastic unless you order stainless-steel tray. Limited 10-year Warranty. Savings of $30.00! Preserve It Naturally Book. Savings of $29.95! The instructions could be better. For example, it is not clear how close to the wall you can put the machine. Does the fan in the back need to be away from the wall or can it be very close? We have had it for about a week and have used it primarily for figs as we had an abundance of figs. I was pleased with the results and wish now that I had gotten the 9 tray unit as it would have held a little more. However, the 5 tray is an excellent buy. It's a lovely machine, except that 3 of the trays were severely warped--usable, but not ideal. Careful with the timing suggestions in the booklet--the timing for carrot chips was totally off. They turned into carrot balls at the end of the least amount of time. After this, I will check earlier. I'll know better after I try nuts and yogurt. Exactly what I was looking for - most parts metal, easy to clean, and efficient. It is oh much better than my old, old round bottom heating dehydrator which would have taken days to dry the morel mushrooms recently picked . Several batches of delicious morel mushrooms quickly dried to savor throughout the season. The enclosed "how to book" gave some incentive to make flax seed crackers which are very tasty. Looking forward to preparing some camp meals and jerky for a backcountry trip.